even these do the clouds no justice. 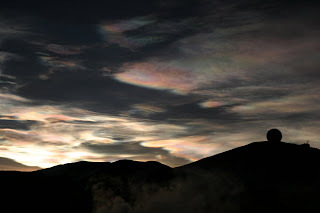 What is a nacreous cloud? with type 2 PSC formation. are recorded in the diaries of the first winter-over group). However they are a key ingredient. Chlorine is released into the atmosphere in the form of CFCs. they end up in the stratosphere, where they are broken down. and thousands of ozone atoms…. the net result being the ozone hole! air floods into the region and the hole disappears. Isn’t the Ozone Hole over New Zealand? This is one of the mostly widely held misconceptions in NZ! hole breaks down and all that ozone-poor air rushes out. instruments. There are links from there too. Oops...sorry about that. I was just told that same information by George L. here on the Ice. Great article though.